Phalaenopsisis a genus of about 35 species of tropical orchids, originating mostly in the hot and humid low lands of the Philippines, India, Indochina, Indonesia and northern Australia. 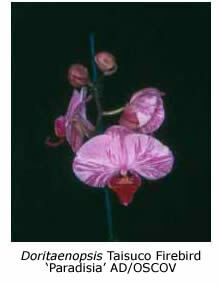 Many of their hybrids produce long, arching sprays carrying ten or more white, pink, candy-striped or even yellow blooms. 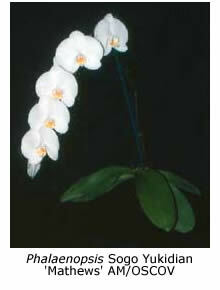 Phalaenopsis orchids are ideally grown within the temperature range of 18-28°C. However, they can be grown and flowered successfully indoors on a window sill if the pots are stood on (not in) a tray of wet gravel in order to maintain a high level of humidity; a low overnight temperature of 12°C will not set them back, providing the room is warmer during daylight hours. Potting. Plants grow well when potted in an open pine bark mix (l0-18 mm), producing firm, thick, healthy, creamy-white roots with olive-green tips. Care should be taken when repotting because these active roots are very brittle and easily broken. Don’t be concerned if the roots climb out of the pot. Repot at about three-year intervals, after removing dead and damaged roots and leaves. Light, Air Movement, Watering And Fertilising. Exposure of the plants to half light (for example behind a muslin or lace curtain on a window sill), good air movement and daily watering will keep the plant actively growing and healthy. Water early in the day, so that the leaves dry by nightfall. Most fertilisers are beneficial, provided that they are used at low concentration is (say, one teaspoonful of Aquasol® per 10 L water) every week or two. Flowering. Well grown plants flower twice each year, usually in autumn and spring. The flowers continue to grow in size after the buds first open. 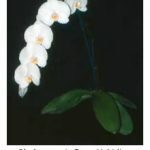 There are usually three or four blooms when the plant first flowers but in the second and subsequent seasons you can expect a tall, arching spike carrying seven to ten blooms, sometimes more. 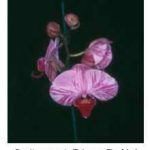 If your plant responds well to your conditions of culture, you may choose not to remove the old flower spike (it usually lasts for two months) but to cut it above a node, thereby initiating a secondary spike, which will flower about 90 days later. Pests And Diseases. Check the underside of the leaves occasionally for mealy bugs and scale, which can be killed by brushing with methylated spirits. Sometimes the flowers are disfigured by brown spots, caused by air borne fungal spores (Botrytis sp.). It is a temporary, seasonal hazard induced when the flowers remain wet overnight in cool conditions. Water lodging at the conjunction of the leaves under these conditions may also lead to the development of brown rot in the crown of the plant. Use a paper tissue to remove water lodged in the crown before it can cause problems. Rots are best treated with the fungicide Natriphene®.